We had a great Christmas! and you? Our Christmases are pretty low key, believe it or not. Our kids get one present from Santa, one from us, and one from one of their siblings. We hang out around our house all morning and then head to my mom's around 3pm. This year was the year of the bike. 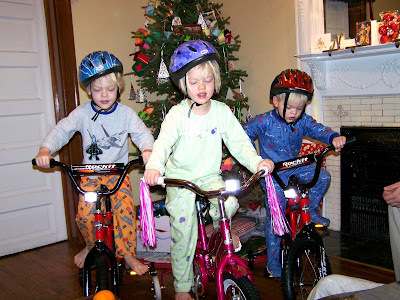 Porkchop, Jellybean and The Meatball all got bikes from Santa. The weather was actually in the 50s so the kids got to ride their new bikes all morning. And yes, after much searching I was able to find Jellybean a bike that was not either covered on Bratz or Barbie, or a stripper pole on wheels. But, it cost me. At least Ladybug will get to ride it, too. Ladybug got a baby doll and a new pram. I don't know if I'll have any woodwork left after the next couple of weeks. Skaterboy got a new phone (that he can't use because his line is blocked until he gets a job and can pay for any overages that might occur. burned this summer. 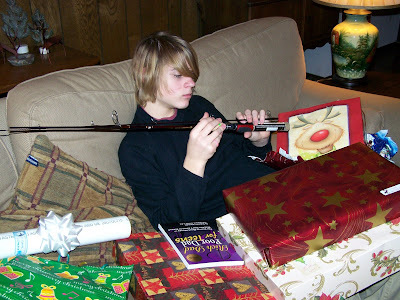 ), Five blank skateboard decks, and grandpa gave him a new fishing rod. And in classic pastor family fashion, Chowder got called away to the hospital right before dinner. Porkchop cried for him nonstop until he got back. Later that night he was called back and the member ended up dying. What is it about this time of year? It's a bummer when the Papas have to leave especially on holidays:( I'm surprised my husband hasn't been called out to fight crime yet. 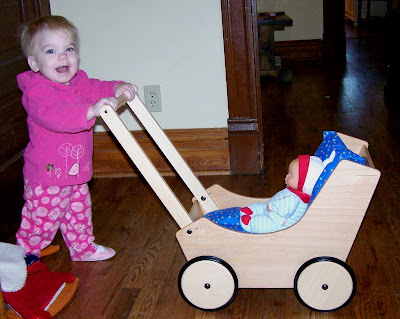 I love the pram! The picture with the bikes reminds me of the year my sisters and I got our banana seat bikes with tassels and baskets:) Thank you for all of your kind comments. Happy Holidays! Oh, man. People do die at the most inconvenient times. Have they no shame? ((HUGS)) to Porkchop. And you. And whoever else needs them. That bike picture, though...how weird is it that Jellybean and Meatball's helmets are tilted at the same, exactly, precisely, mathematically identical angle? Does that sort of thing just happen with twins? I'm glad you found a non-trollopified bike, btw. Hard to do these days. Sammy! Glad you broke through! In all fairness I let him use it on Christmas Day. This past summer after months of responsible phone use, he wracked up a bill over $300! Jenni~How funny is that! I didn't even notice! Sorry about Chowder being called away - there's something about December that brings on sickness and death, we've noticed here, too.